If you are looking for the best places to stash your extra cash, check out DepositAccounts.com. Before I renew a CD or wanna go rate shopping for a savings account that pays the highest interest, that’s where I go. 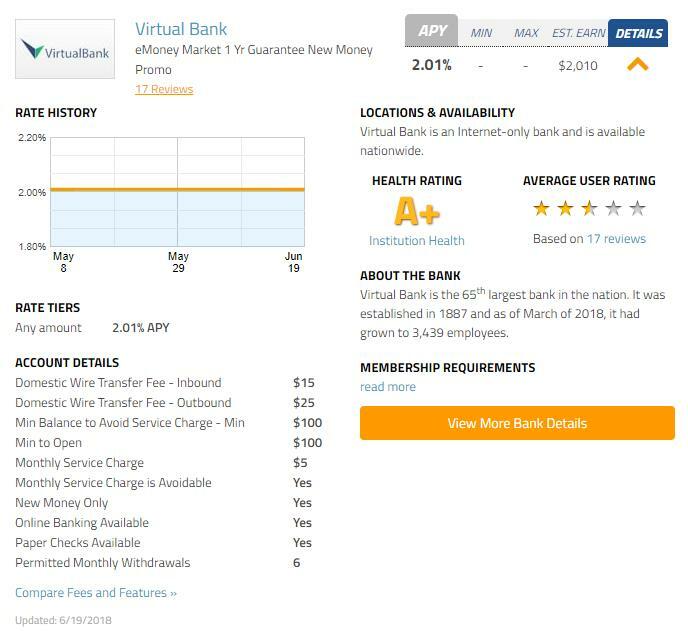 Your best rates will be at an online bank – not your brick and mortar bank down the street. That’s okay! Don’t close your existing accounts. Once you find a high rate online savings account, you will fund it from your existing checking or savings account at the brick and mortar bank via the online. According to Federal law Regulation D, you are only allowed six withdrawals or transfers per month from a savings account. Plan accordingly. It is a savings account, not a checking account. If you are super cynical (like I can be), you can confirm that your chosen online bank is FDIC insured here. I’m a rate-chaser from way back. I have or have had online savings accounts at over 20 different banks. It’s safe, people! My main brick and mortar bank (can you tell I like saying “brick and mortar”?) is Wells Fargo. As you can see below, their savings account pays .01% interest. Don’t be fooled, that’s not 1%. That’s 1/100ths of 1 percent. Don’t believe me? Ask a 6th grader. Compare that to Virtual Bank which pays 2.01%. That rate is 201 times what Wells Fargo pays. Whatever your branch down the street is, it also has terrible savings rates. So check out DepositAccounts.com and hook yourself up with a high interest online bank account.